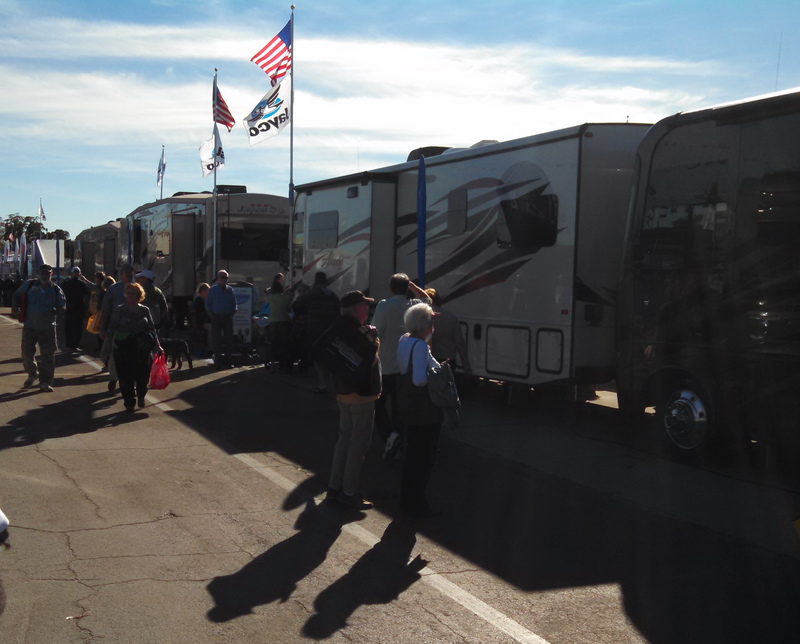 Every January, the biggest RV show in the country takes place at the Florida state fairgrounds in Tampa. 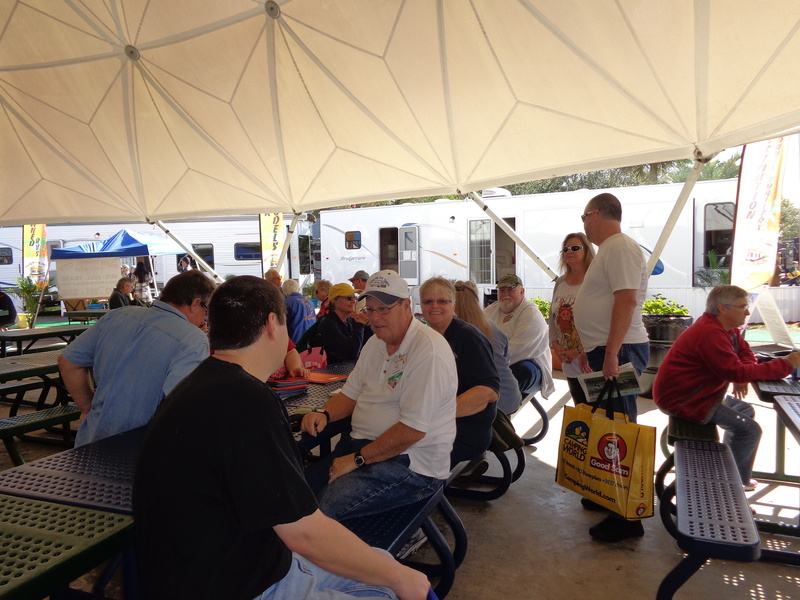 We have heard a lot of good things about the Florida RV Supershow, and decided to check it out last week. Everyone we talked to said it is too big to see everything in one day, and they were correct. We spent 2 days at the show, and still did not see everything that was there. 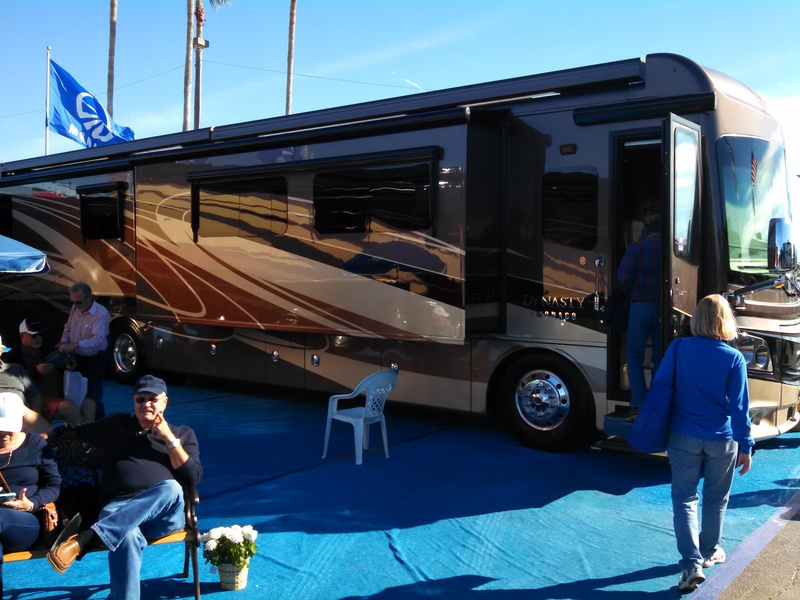 They had RV’s of every shape and size, from $4,000 trailers to a $3 million dollar custom coach. 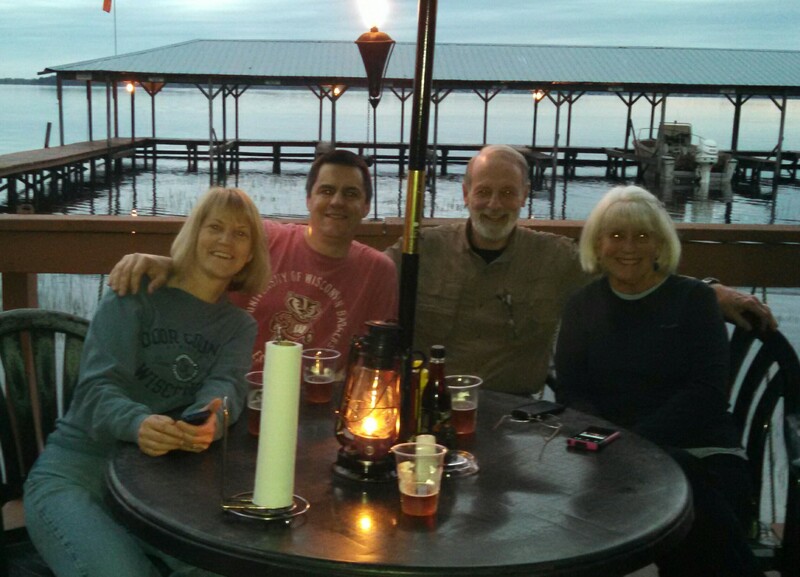 We also ran into Kristen and Jason (Snowmads), whom we first met last January in Cedar Key, FL. 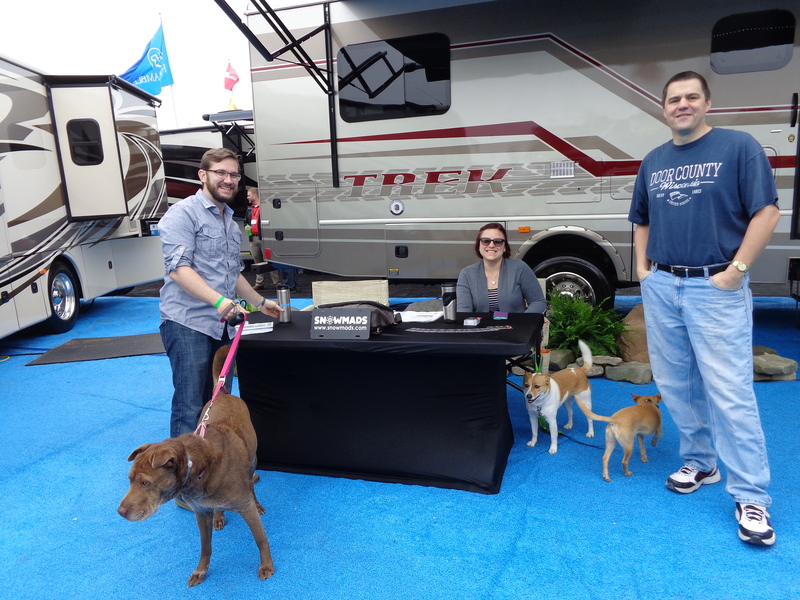 They have sold their Airstream trailer and will be venturing out in a new Trek motorhome, which was on display at the show. They travel with three dogs that were happy to great all visitors at the show! We also ran into a number of co-workers from Amazon, and had a nice lunch with everyone. 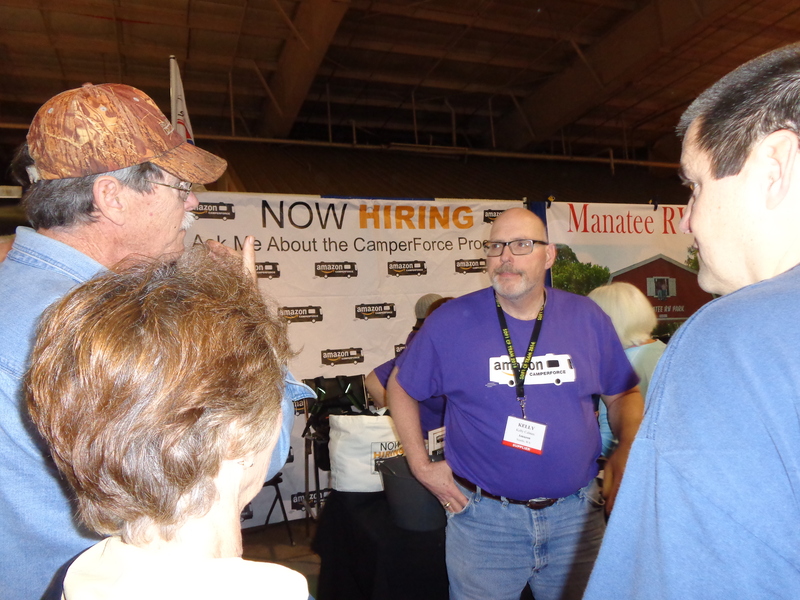 Then all of us went over to one of the exhibitor buildings, to say ‘hi’ to the human resource personnel for Amazon that handle the Camperforce program. Kelly, in the purple shirt below, was our HR rep that came with us up to Jeffersonville, IN last December. 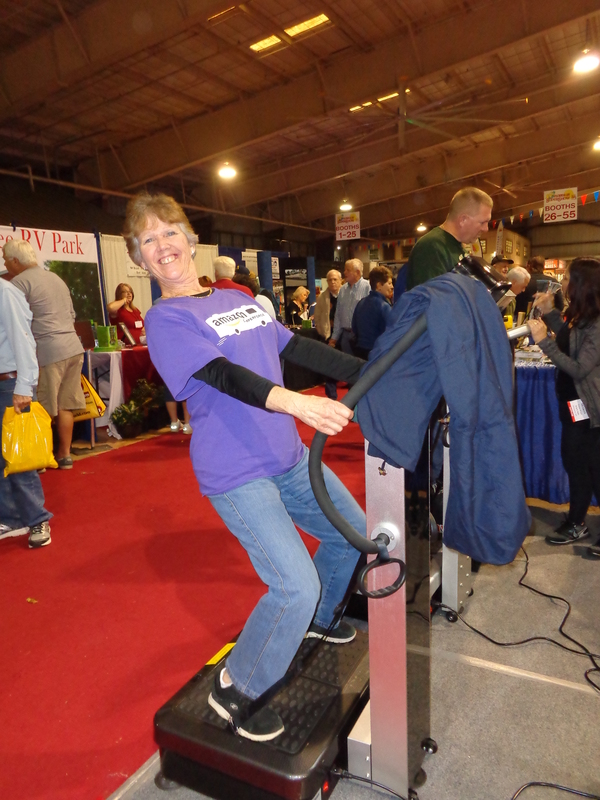 Across from the Amazon booth, was a booth selling these “exercise” machines, that you stand on and “lose weight” due to the vibrating movement! Donna was checking them out. I think Amazon is a more effective weight loss program. 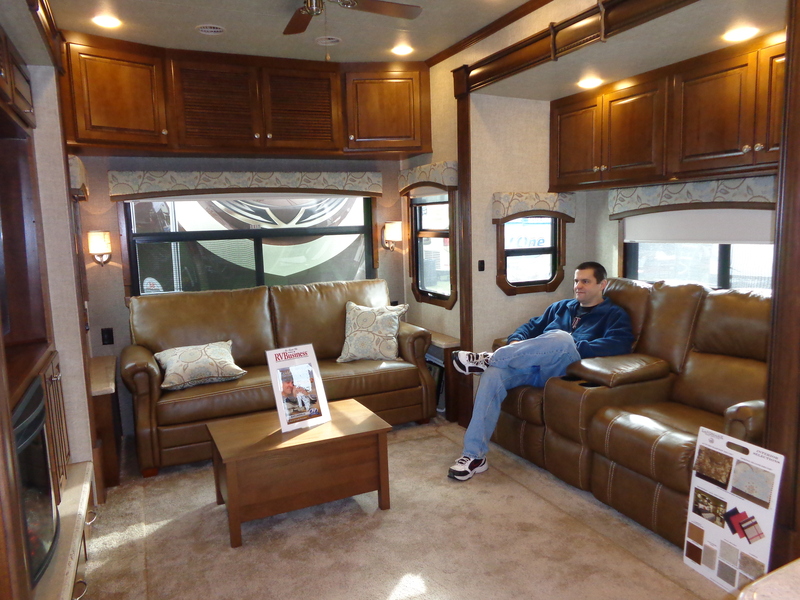 After lunch we ventured over to the Heartland display, and checked out the brand new Charleston 5th wheel model. It received the ‘Best in Show’ ribbon. 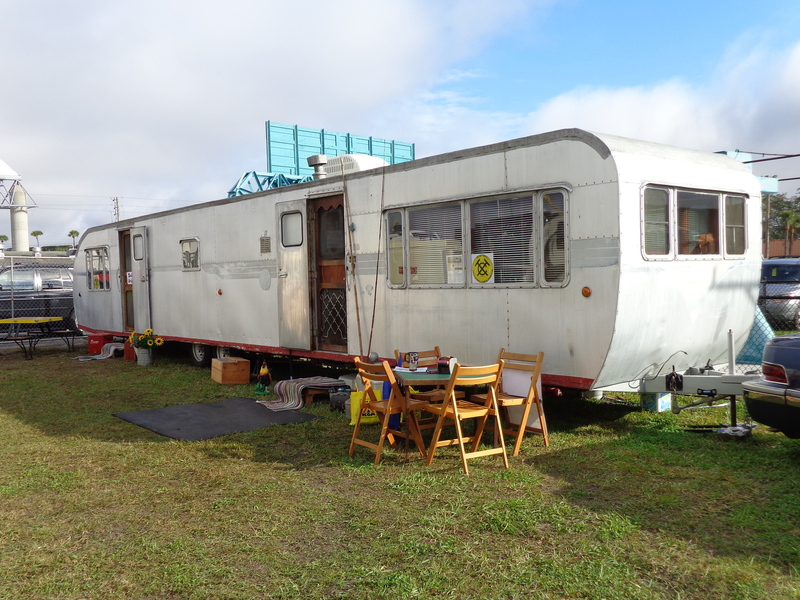 It was a beautiful 5th wheel, and had a very residential feel to it. We noticed many of the 5th wheels are now including residential refrigerators, induction stove-tops and dishwashers, as options. Dan was able to spend some time talking with a technician from Heartland about some routine maintenance questions that he had. That is one nice part about a big show like this, as they usually have the representatives from the manufacturer’s to talk with, and not just sales representatives. Of course if money was no object, I found a coach that I could live in, the Monaco Dynasty 45P! 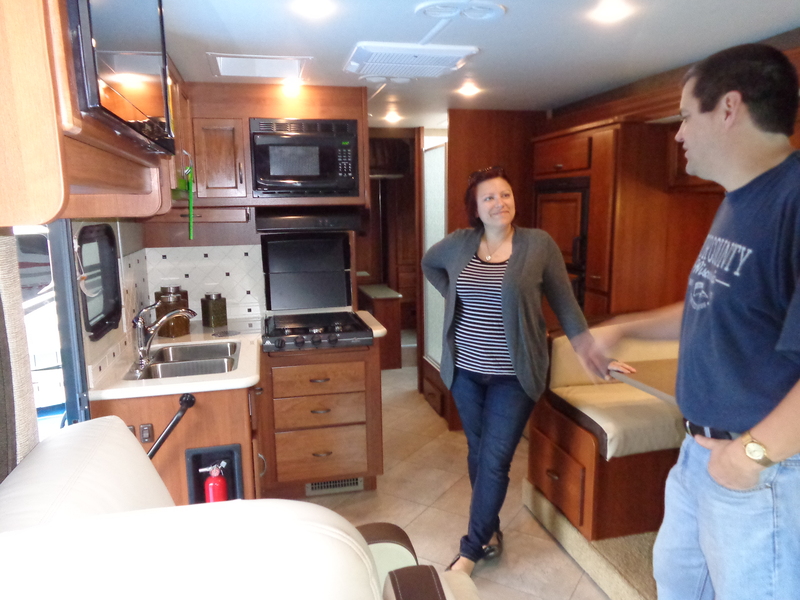 It was one of a few motorhomes that had a lot of storage space in the kitchen, a comfortable layout in the living area, a shower that you can move around in, and a curbside dinette. They had a few antique trailers on display, including this 57 foot long, long trailer. 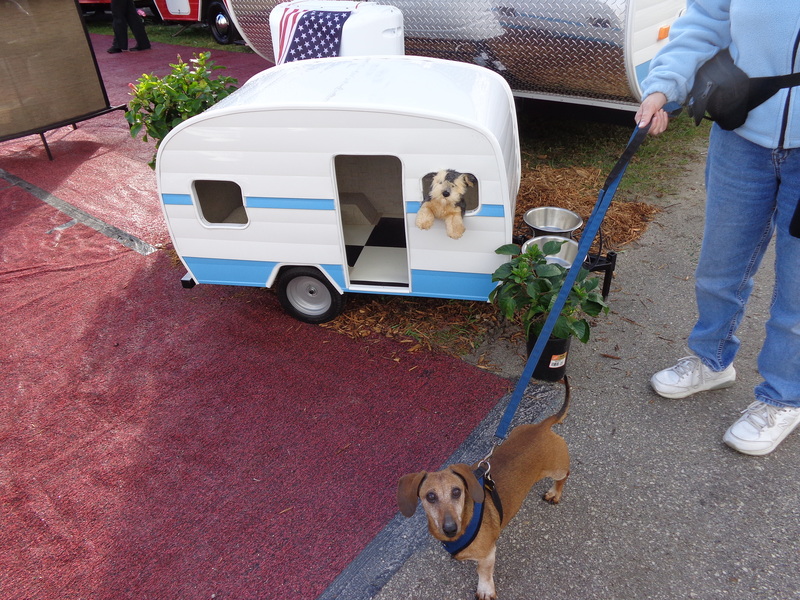 And we found a little trailer that would be perfect for Makena. You can spend a lot of time walking at this show, as there is row after row of vehicles to look at. And we saw many RV’s with ‘sold’ signs on them, including some in the seven-figure price range. On the second day we attended the show, we were finally able to meet up with two more couples whose blogs we have followed for a while. 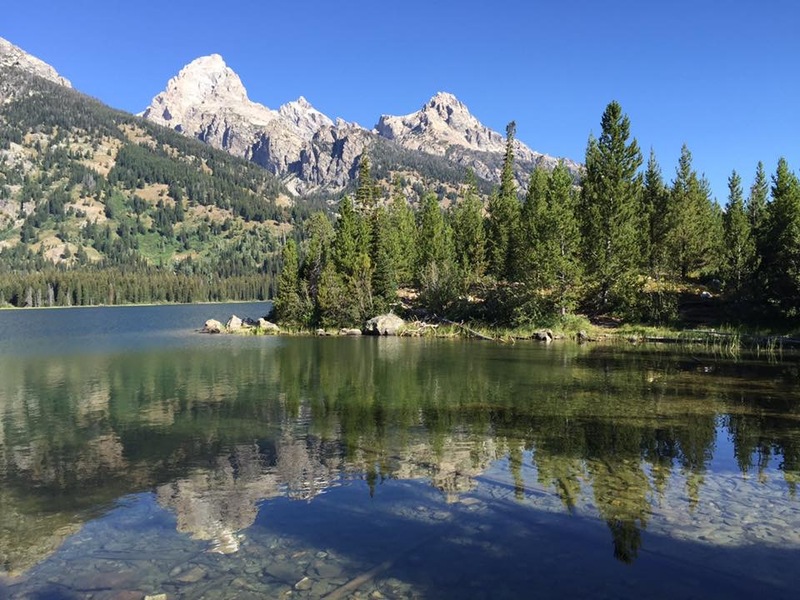 John and Kathy, have an excellent podcast (available on ITunes) that we have listened to for several years, as well as a blog and website, Living the RV Dream. Nick and Terry of the Gypsy Journal were also at the show. In the photo below, Dan is talking with John (in the white shirt), with Kathy behind him. Terry is a bit hidden behind Kathy, and Nick is sitting on the end of the bench. We had a nice conversation about full-timing with both of them, and look forward to meeting up with them again somewhere down the road. Hi everyone, it’s me again, Makena. 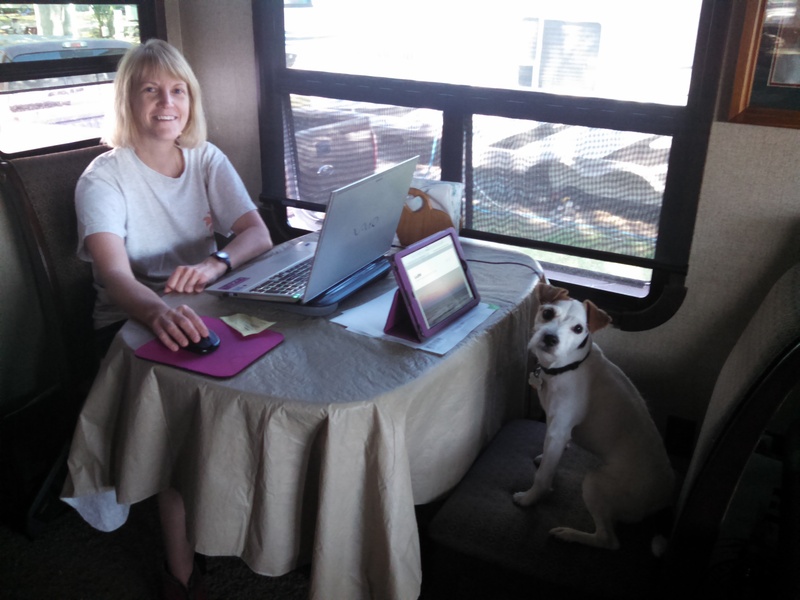 For the new followers, I like to occasionally steal my parents blog and write about living in an RV from a dog’s perspective. After my mom’s last post about Amazon, I heard her comment that was post #99. Since 100 is a pretty big number, I knew it was time for me to post again, since I managed to steal the 50th post. I have been enjoying my time in Florida. It has been full of presents, sunshine, and best of all, visitors! And it is nice not having that alarm clock scaring me half to death at 5am. A perfectly good night of sleep is ruined by that screeching ‘beep, beep’ noise, followed by my mom’s grumbling. 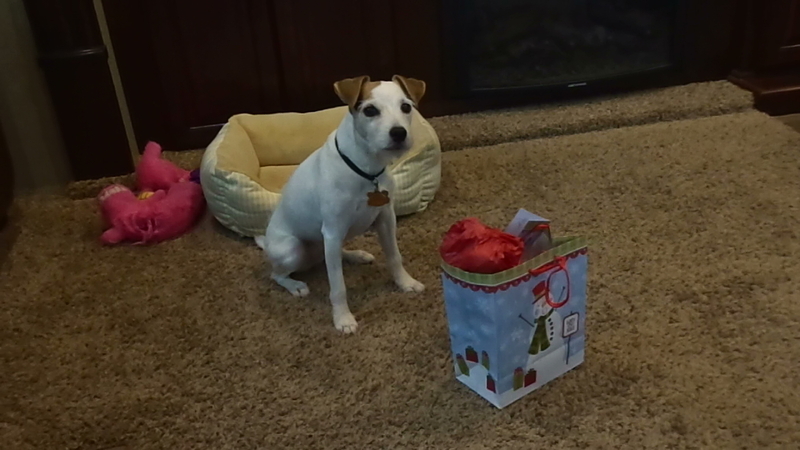 My Christmas wishes came true – I had some really nice presents to open. Nice to see my parents use those gift cards on things other than gas and groceries! 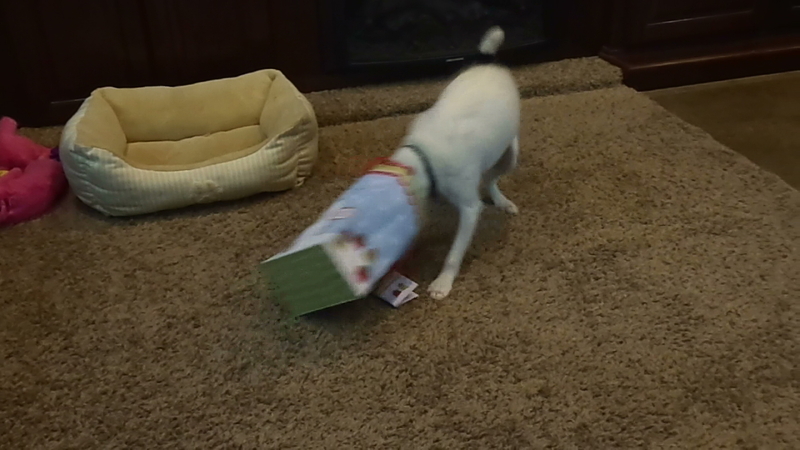 I really enjoy opening presents. My parents made me sit patiently staring at my package for a while. Oh, the suspense! I finally received the ‘okay’ command, and it was off to the races! 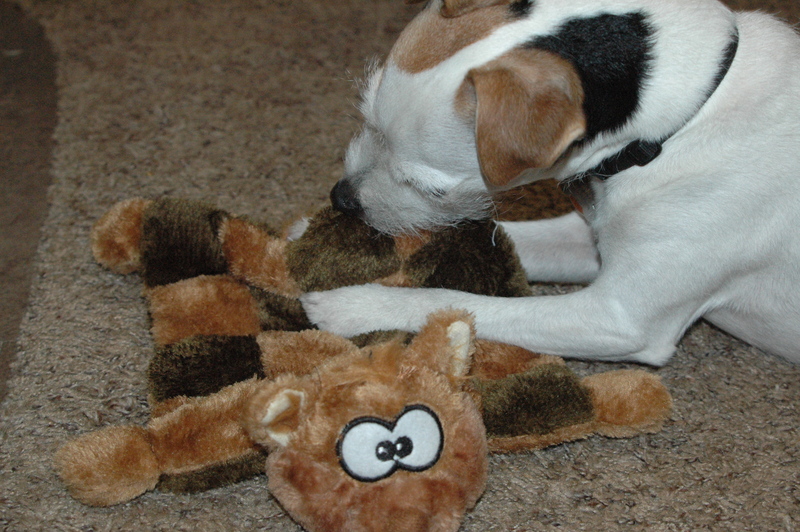 And much to my delight, I received a squirrel with sixteen squeakers!!!!! Best gift ever! Take a good look at the squirrels head…he was beheaded about 30 minutes later! 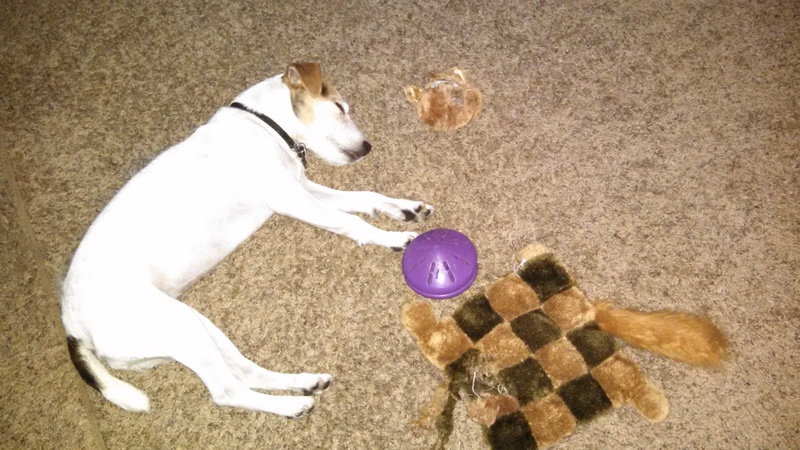 I was able to get three squeakers out, before I decided to take a nap. 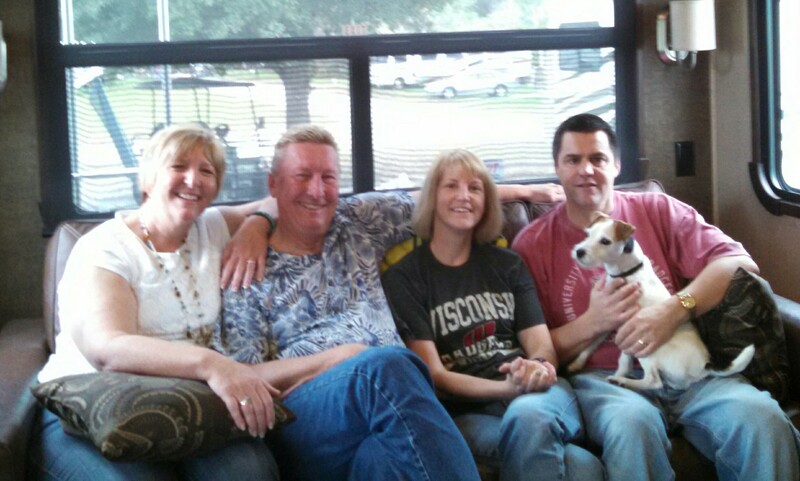 My pals Steve and Joan, from Crazy Horse also stopped by. They were home for Christmas to visit their family, and are now back in Lake Mead for the winter, where they do some volunteer work. Karen and Al, also fellow Amazon workers, stopped by as well for lunch, and Disney planning. We will all be going to Disney the first week of February, so they dropped off some DVD’s for my parents to watch. My mom is pretty clueless about all these Disney characters so she has a lot of homework to do. 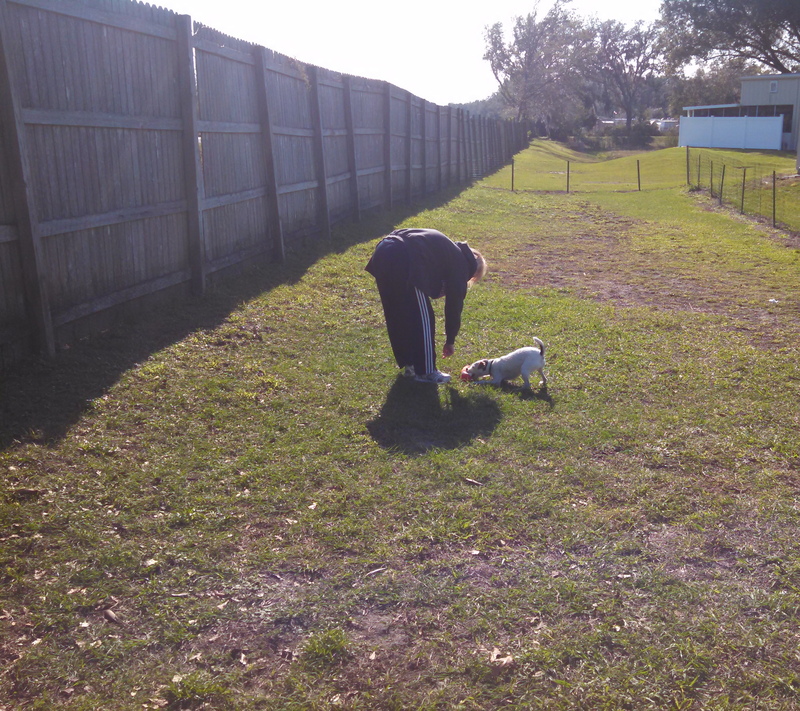 The park we are in now has a fenced in dog area, so I have been able to get out and play almost every day!! It’s not a pretty dog park, but it’s a great use of space right along the fence. I wish more parks would do this, as I have a lot of energy to burn off. 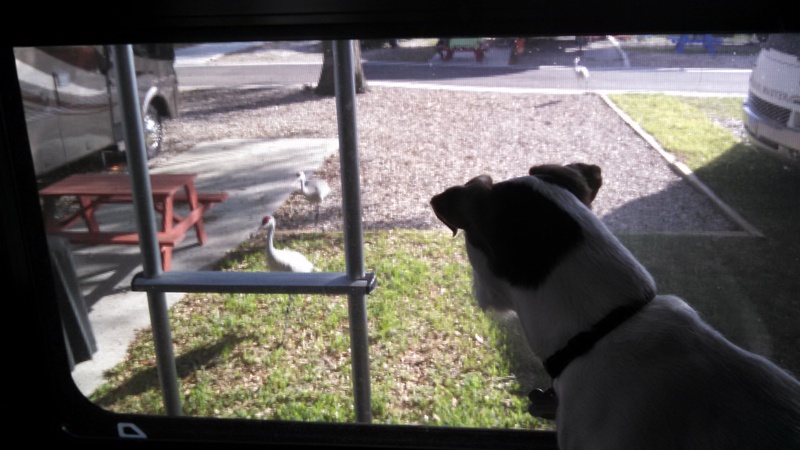 And when I am not busy playing outside, I watch these super noisy sandhill cranes go by every day. They are bigger than me, so I keep a safe distance! Well that pretty much brings you up to date with my social life. Hope everyone had a wonderful Christmas and New Years! Now that the dust has settled, and our final checks have been received, including the retention bonus, I will have one last post on our fall work camping jobs with Amazon. If you want to read more posts on our time at Amazon, you can go to our home page and click on tabs for Amazon. This was an unusual year for us, as we began our 12 weeks at the center in Campbellsville, KY, where we worked in 2013 as well. Our second year was going well, and we renewed old friendships, and made new ones as well. Our final 4 weeks were spent at the center in Jeffersonville, IN (SDF-8). I have previously blogged about how we ended up there. Overall, we had a good time up in Jeffersonville, IN. It was very crazy when we started, as they had just hired on 1400 temporary employees over the last 10 days before we started. Clearly, management had too many people to watch over, and it was a bit entertaining, and frustrating, watching so many people stand around and not work. But over the next 10 days, management seemed to catch up, and many of the temps were no longer employed. Amazon does not tolerate people who have no desire to work. As far as the work, we enjoyed picking apparel, jewelry and watches compared to some of the heavier items we picked in Campbellsville. SDF-8 is clean, climate-controlled, and well-organized for picking. Our managers were very pleased with the performance on the Camperforce team. Several of them commented that our “numbers” (production) were equal to or even better than their veteran full-timers were doing. They were hoping that our work ethic would rub off on the “younger” employees! Over and over we heard how they want to have a full Camperforce team next year, because they would not have to hire so many temporary employees. HOW MUCH CAN YOU MAKE IN A SEASON? The center in Kentucky (SDF-1) pays $10.00/hour and includes your campground. If you work 2nd shift, or the weekend day shift, you will receive an additional $0.60/hour as a shift differential. If you complete your season, you will receive an additional $1.00/hour for every hour that you work. In addition, you receive time and a half for all hours worked over 40 in a week. SDF-1 hires about 500 Camperforce, starting at the end of August, going through the middle of November. We like working 12 weeks, so we start at the end of September. The pay rate in Indiana was $10.75/hour. We have not heard what the pay rate will be for this fall. Our total gross pay for the 12 weeks at KY/IN was $12,983.61. This amount does not include the additional bonus money that we received for going to Indiana. Amazon paid us $1,000.00 each (net) for going up to IN. This was a one-time deal. We also each made additional money in gift cards for working there. Indiana was very generous with gift cards. For working 59 1/2 hours, we each received a $100.00 VISA gift card (we did this for 2 weeks), and we received another $100.00 in gift cards from Target, Subway, Panera Bread, Applebee’s, and Texas Roadhouse for various contests they held for picking. Another workcamper won over $400.00 in gift cards for these contests. From talking with other Camperforce, the IN facility was the most generous facility in perks. We also had three free pizza lunches, cupcakes, fruit, Panera treats, and several Krispy Crème donut days in Indiana. Yes, we will go back for our 3rd peak season! Amazon is not an easy job, but it pays well for a workcamping job, provides a free campsite, has some nice perks (gift cards), and gets us in good shape! But the best part of the job, is all the wonderful people that we meet. There is something about making it through a season that brings people together. Your co-workers become an extended family, and you can make some wonderful friendships if you want. Amazon is also a great place to work if you are a single, or have a spouse that does not want or need to work at Amazon. They just want people who are willing to show up and work for the season. As long as you realize you are just there to work, and not change the culture of how Amazon does things, you will do just fine. Also, Amazon is a great way to network about other work camping jobs. All of our other jobs have come from talking with co-workers about jobs. In addition, the KY location has an annual job fair in December that is well attended by employers. The program will be changing this year, as the centers in Coffeysville, Kansas and Fernley, Nevada have closed (Amazon has opened newer centers near those locations). According to Amazon’s Camperforce website, they will have programs in place in KY, TN, IN and Haslet, TX (which is a new site). The site does state to check after January 15, 2015 for more details. We have not heard any details on what the pay or campgrounds will be for IN. We would consider going back to KY or IN, depending on the terms. We will wait to decide on the location until we have more details. And a drum roll please…..the one thing our families have been waiting for! The final weight loss numbers from our 12 week fitness program. For the first time since the 1980’s Dan weighs under 200 lbs. He lost 14 1/2 pounds this year after losing 27 last year, as well as 5% body fat. I lost 6 pounds (too many dinners out!) but 6% body fat! If you have any questions regarding Amazon, please let us know.